I have always struggled trying to understand why BIM is so difficult to implement. It makes sense to me –why doesn’t everyone else see that? In a recent meeting with a Design Partner I finally had my big ah-ha moment. That moment came with the realization of why BIM never quite seems to work the way it should: the basic principle of BIM throughout the project workflow misses the needs of the Designer. There always seems to be a breakdown between the Designers toolbox and the documentation software. I’ve never understood why the Designers can’t use the software provided as intended, but it turns out the flaw is in my understanding of the Designer’s thought process. This is where I have had a difficult time understanding why the word BIM makes some roll their eyes. BIM is used to capture information within a modeling environment using tools to create documentation. It’s being used by a designer who wants to be able to iterate, work out and mess with design throughout the process of the project. These two strategies are not fundamentally opposed, but my discussion with the Design Partner made it clear that the designer needs to have a tool kit that includes an array of different options. To unlock the potential of BIM, Designers need to be able to collect and test ideas to learn about how the information available to them can be translated into an amazing project. This idea has set me on the path to re-educating myself in how BIM and design can work together. I think the key to successful BIM implementation is finding a way to help designers explore different ways available data can been used to generate form. 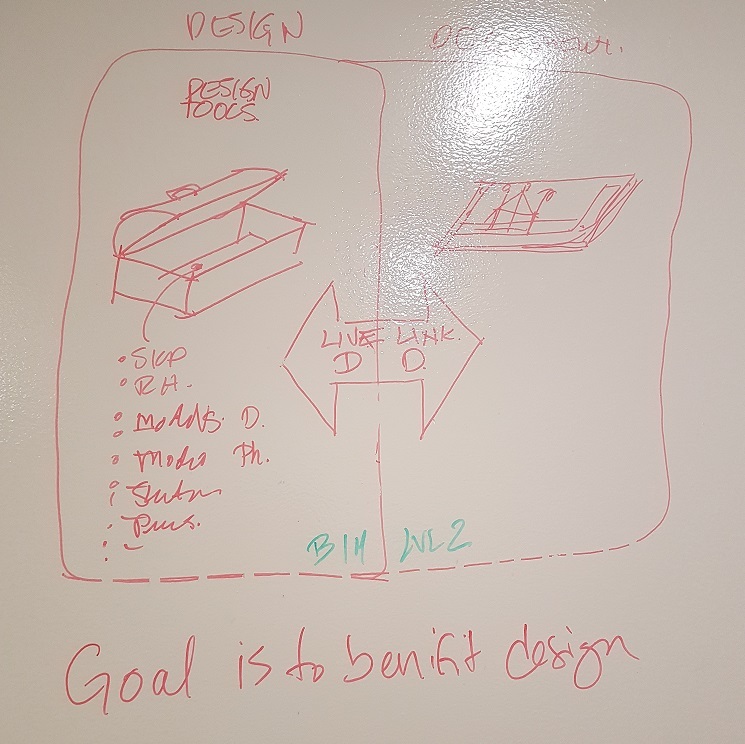 My goal has always been to simplify information capture in the BIM model so the designer can focus on the essence of the project, so the question becomes how do we give the designers the toolkit the need and get to our BIM goals? What we need is a two-way connection between our documenting software (which is usually Revit) to our design pipeline. This can include paper sketches or work in SketchUp, Rhino, 3D Max, and whatever exciting and new visualization tools that make our product look amazing and beautiful — something historically been lacking in Revit). BIM software is designed to incorporate a tremendous amount of information, and it can be difficult to use with the limited amount of information that is available at the early stages of design. The work of design needs to be fuzzy and incomplete so the design itself can be reviewed while it is incomplete. These soft edges to the design allows us to work within constraints with the information provided. Providing data from within a model that we’ve already begun allows the designer to maintain design intent while reviewing the results of visual or functional iterations of the product. A live link in our documentation can give our designers a workflow that allows them to follow the standard design practice of a general idea becoming more and more specific. This reviewed and tested idea can then be placed into the documentation process. This is winning at implementation. The whole process was described to me as follows: the project is like a car. I’m the mechanic. My job is to make sure that the engine continues to run and the design can still maintain visual aesthetics. Seeing this image drawn by the design partner (who is in essence an artist) completely changed my perspective on the project. Illustrating the need in BIM management is that simple: we need to create a workflow that feeds the design intent into the documentation process throughout the lifecycle of the project. Does that not blow your mind? To further emphasize the communication barrier between designers and BIM managers, I explained to the design partner that I can see this as a cake. This cake is built with layers: my work is the layers underneath the icing. The software and tools support the process. Although this metaphor worked for me, it wasn’t a fit for the design partner. For him the design is a car and I’m a mechanic. His argument was with a cake the icing can be removed. It may not be the most delicious cake, but it’s still edible and therefore serves the basic function of a cake. You can’t have a car without an engine, and that’s an important distinction. BIM managers need to learn to use language and metaphors that speak to designers, otherwise we will continue to have difficulties convincing teams to work with us on projects. My challenge is to mediate between the process-driven linear development that makes sense to me, and the less direct creative method of designers: we need to find a way to bring them together so that each can better communicate their issues and concerns.